Uranium belongs to the Actinides family, has chemical symbol U and atomic number 92. Uranium is a chemically very reactive, highly toxic, grey heavy metal. Like all actinoids it is radioactive, after thorium it is the second most stable of those. The most abundant natural isotope is 238U with a half-life of 4.5 billion years. The basis for nuclear power plants is the fissile isotope 235U. The fission products often are highly radioactive isotopes of lower elements, like caesium 137 and strontium 90. Uranium 235 is used for atomic bombs, too, like the one in Hiroshima. It has a natural abundance of only 0.7 % and has to be enriched in an extensive process. For power plants, at least 3 % are needed, for weapons much more. The waste material of this process, depleted uranium, sometimes is used in ammunition, sometimes is turned into plutonium in a breeder reactor, most of it is waste. A secure repository concept for nuclear waste doesn't exist. Natural uranium decays to thorium. 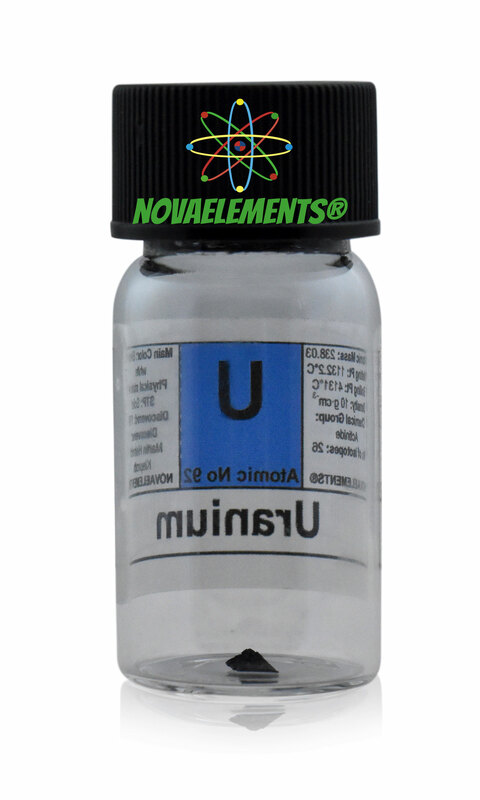 Incredibly rare and high purity Uranium metal, sample of the element 92 of the periodic table of elements!